Now Add the Idea of Custom Printed Play Money AND Chippendales?? Imagine the onslaught. The insanity. 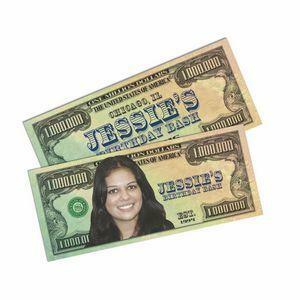 The women tossing custom printed play money! And you get the picture. The idea is that you’re giving your customers another avenue of spending that makes them feel good. You can do this for magic shows, concerts, musicals, and much more. As the play money is so customizable, you’ve got no limit, not even the sky. Set up promotions for shows, all kinds of shows, with that printed money as a focal point, make it a way to earn prizes after spending X amount of play dollars, have your guests turn them in for more chips. Keep them playing the slots, the tables, and much, much more. The possibilities are pretty endless. All it takes is the creativity, and the industry fits beautifully! Go above and beyond the standard: you offer the chips, they buy. They win or lose. All you need to do is make them win more while winning on your own! BRAVA Marketing has all the options for you in one page. Pretty convenient. All the chips are on the table, and you better believe you have all the possibilities you need right here. Once you’ve got a look that fits your style, guess what: you just have to contact us! Do that, and the jackpot’s all yours. Of course, the vending machine is just an idea. Really, a company can have just about any perk on a small scale (one that’s purchasable with play money, as in plastic COINS) and excite employees to want to do their job above and beyond the call of duty. Motivated employees is the nitro booster of productivity and ROI, simply put. The thing is you want a way to motivate them without just offering bonuses (because, believe it or not, even that can be a little trite and tired for the average worker). Why not go the extra mile? Offer play money like plastic coins, and insert a certain value them! And then some…. The fake (it has to be fake) vending machine is just an idea, but can you imagine just how novel an idea that is? On any given day, an employee can do such a great job and perhaps contribute to substantial profit, resulting in a jackpot of fake play money coins. But not just any coins (branded with your logo). These coins will actually count toward all sorts of treats. To our knowledge, we don’t know of any business doing anything like that, and the best part is it’s virtually free to maintain a vending machine for good reason, as you can get the goodies in there for a low cost, especially when you buy in bulk. But the value coming back to you is priceless. This also saves your employees the trouble of spending their own hard-earned cash just to get a Snickers bar when all they need to do is do the job well, earn some branded coins, and then get their fix. And they didn’t even have to save up on quarters. It has to be one of those toy ones, like a gumball machine. Simply set it up to take just about anything, and then it releases the goodies for your employees when they’ve earned it. Keeps employees happy. Keeps them hyper. Because we all know hyper gets the job done! Just check us out at BRAVA Marketing and look at the selection we have right now. 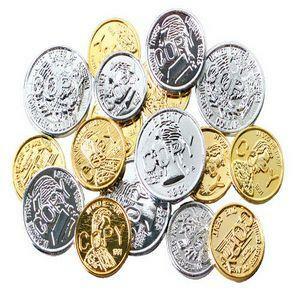 You can even get branded “pirate” coins! Contact us today! Why a Company Poker Game Can Go REAL Well With Play Money! This should be obvious…. After all, not one employee would want to come to a company poker game, lose to the CEO a whole lot of money. It’s almost an insult. The very next week, that employee would get a paycheck of all the money he or she lost! That’s perhaps why not one company, to our knowledge, has seen the value of the “company poker game,” a novel way to connect with your employees, your managers, and whoever, and promote business wellness and employee morale. There’s really nothing wrong with it. Just don’t do a company poker game in the office. Then it just gets weird. A company poker game needs to be somewhere else, but here’s the kicker — you’re not going to want to play with REAL money! No, no, no. Why not use custom branded PLAY MONEY instead?? Like Monopoly money! You can imagine the possibilities, and there is a wide variety of styles to choose from, all customizable, if you click here. And here’s the thing: it’s not just play money, but a chance to promote employees just for playing by listing a value to each dollar. Each dollar could be a free day off with pay, for instance. Or you can have gift cards, purchasable with that play money, and really all your employees would have to do is freakin’ show up. Bring their know-how of poker, get their bluff faces on, bring out the beer (or pop), and get down to business. When you think about it, it’s way better than playing company baseball. What do you get for that? NOTHING. But grass stains. No, a poker game ensures you keep your employees, and you can even brand a set of play money according to each employee to make it even more personalized. Sounds like a full house to us. BRAVA Marketing has the selections right here. Just contact us right now. Remember this, though — BRAVA Marketing might have a royal flush!